A recent study from iSeeCars has identified the vehicles most likely to reach 200,000-miles. The study is an eye-opener for potential car buyers. 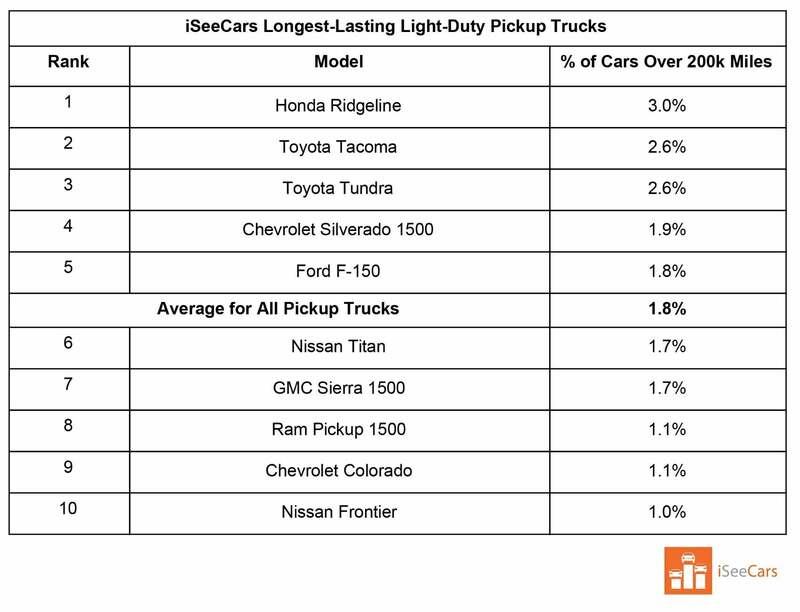 If you’re in the market for something new, this study reveals the longest-lasting vehicles on the road today. It not only covers SUVs, sedans, and pickups, but also offers insight on luxury and sports cars. The study ultimately shows that while modern vehicles benefit from advances in technology and manufacturing, some are simply better than others. SUVs, for example, are among the most reliable vehicles today. And if you think squeezing 200,000 miles out of your car is absurd, the study also includes the highest percentage of vehicles likely to reach 300,000 miles. Yes, these cars do exist. They are out there somewhere, churning more miles than Forrest Gump on a depression-fueled running binge. Let’s take a closer look. The study involved over 13.8 million cars sold last year. 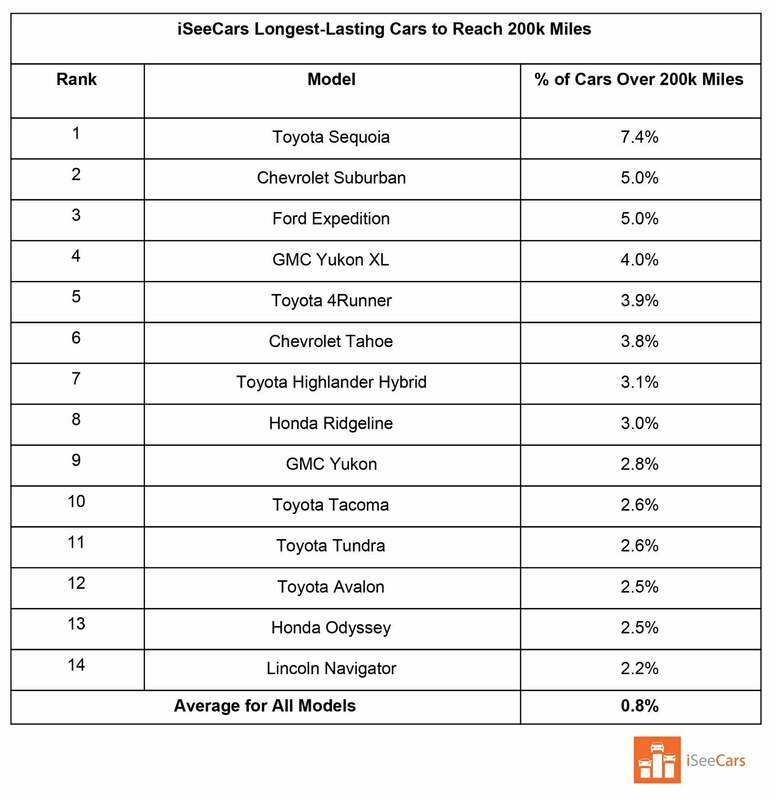 Using that data, iSeeCars found 14 vehicles most likely to eclipse the 200,000-mile mark. 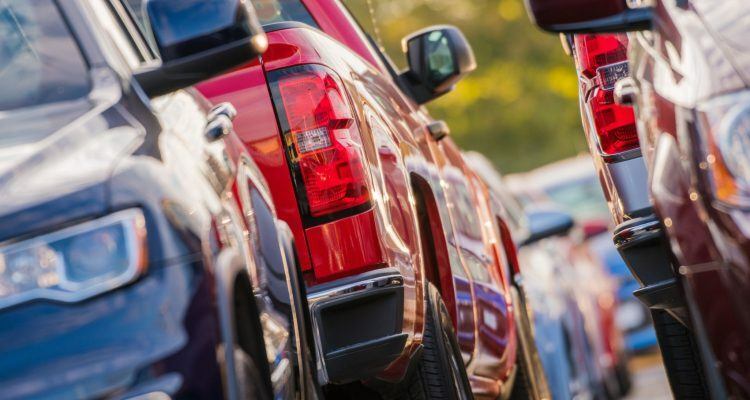 The average nameplate has .8% of its vehicles achieving 200,00 miles or more, but car shoppers can increase their odds by considering one of the 14 entries on the list. Earning the top spot is, unsurprisingly, the Toyota Sequoia full-size SUV. The study shows 7.4 percent of Sequoias have logged 200,000 or more miles on the odometer. Tied in second and third place respectively are the Chevy Suburban and Ford Expedition. Next is the GMC Yukon XL (4.0%), Toyota 4Runner (3.9%), Chevy Tahoe (3.8%), and Toyota Highlander Hybrid (3.1%). Further down the list we see the Honda Ridgeline (3.0%), GMC Yukon (2.8%), Toyota Tacoma (2.6%), and Tundra (2.6%). Also included are the Toyota Avalon, Honda Odyssey, and Lincoln Navigator. iSeeCars analyzed over 13.8 million vehicles sold in 2018 to find which ones are most likely to hit 200,000 miles. The top 14 have at least 2.2 percent (almost three times the overall average) of their vehicles reaching 200,000 miles. According to the data, SUVs are among the longest-lasting vehicles. 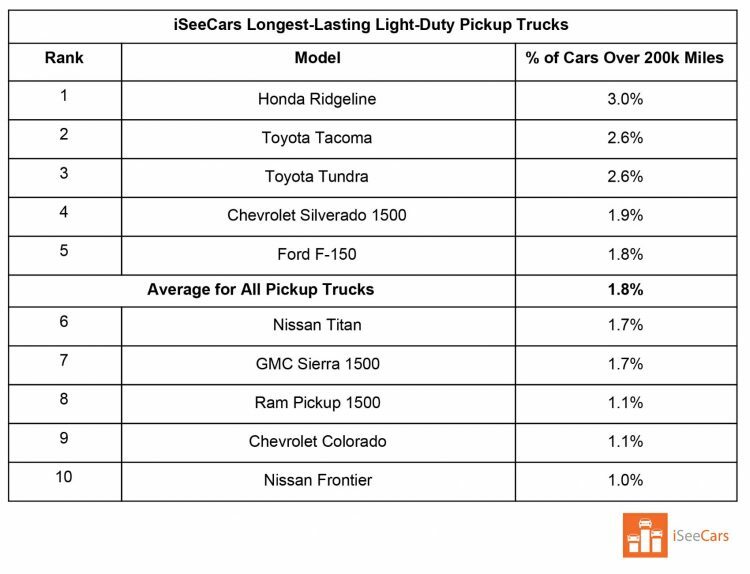 According to the study, the top five trucks are the Honda Ridgeline (3.0%), Toyota Tacoma and Tundra (2.6%), Chevy Silverado 1500 (1.9%), and Ford F-150 (1.8%). The Nissan Titan, GMC Sierra 1500, Ram 1500, Chevy Colorado, and Nissan Frontier each bring up the rear. The Silverado ranks higher than the Sierra, something we find odd since both come from the same Fort Wayne, Indiana assembly line. Suffice to say, both trucks are mechanically identical, albeit targeted at different buyers. On this particular list of tough workhorses, the Honda Ridgeline sticks out like a sore thumb. It is the only one with a unibody (unit-body in Honda speak), or a car-like platform. And yet, it manages to be the study’s top truck, besting its more rugged body-on-frame competitors. 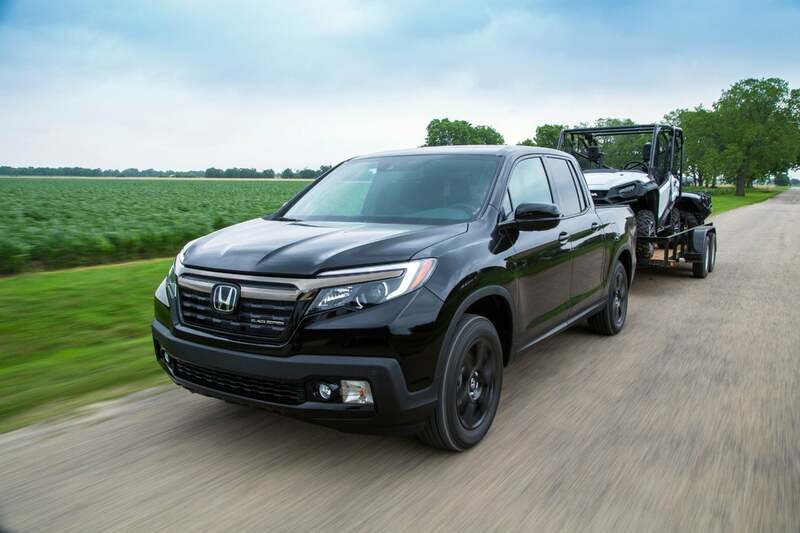 “While we weren’t surprised to see this vehicle on the list as Honda has a strong reputation for reliability, we found it interesting that the unibody Ridgeline was the longest-lasting pickup,” Blackley said. The Honda Ridgeline utilizes six different grades of steel, including high-strength and ultra-high-strength steel in the unit-body. An aluminum hood and front bumper-reinforcement beam combines with a cast-magnesium steering hanger beam. These materials and their placement were determined by strength, safety, and overall performance, according to Honda. Versus the prior generation, the new Ridgeline has 28 percent greater torsional rigidity, meaning it’s more rugged than it looks. The Honda Ridgeline utilizes six different grades of steel, a contributing factor to its longevity. Photo: Honda North America. Six of the 14 vehicles in this longevity study carry a Toyota badge. The results mirror a similar study conducted by iSeeCars that focused on ownership; specifically cars that original owners were most likely to keep for 15 years or more. After analyzing over 750,000 vehicles sold last year, iSeeCars found that Toyota owners went the distance in terms of ownership. Although revealing, these findings are not exclusive to research conducted by iSeeCars either. 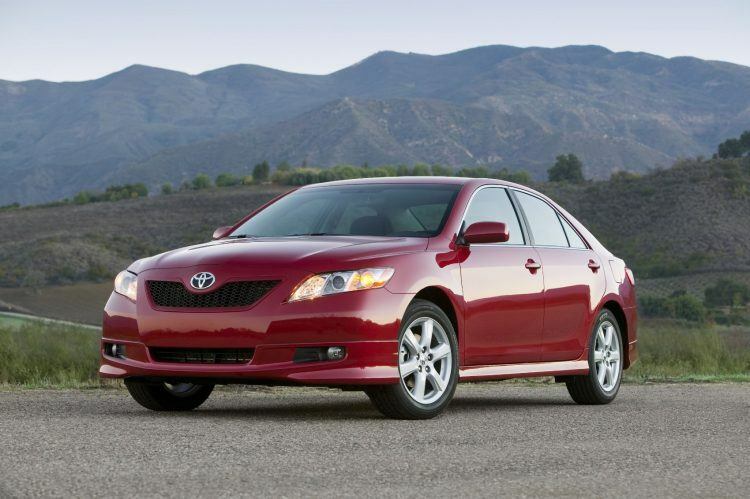 Toyota vehicles remain the creme of the crop in other similar studies. Toyota was named for a third year as the Best Brand in Kelley Blue Book’s Best Resale Value Awards. Kelley Blue Book said of the award that Toyota has a reputation for building high-quality vehicles. On KBB’s list, the Tacoma received top honors for resale. 2007 Toyota Camry. 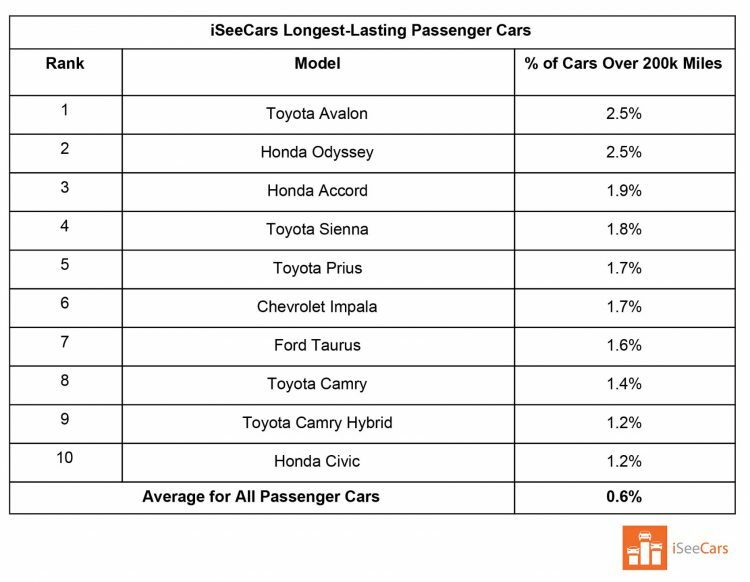 Photo: Toyota Motor Sales, U.S.A., Inc.
Perhaps one reason why Toyota tops this study from iSeeCars (and other similar ones) is the company’s commitment to quality and innovation. In 2017, for example, Toyota opened their $80 million, 235,000 square-foot Production Engineering and Manufacturing Center (PEMC) in Georgetown, Kentucky. The facility serves as a home base for more than 600 Toyota production engineers with a 50/50 split between desk and collaboration space. All desks are sit-to-stand and engineers regularly meet with other teams. The goal? All 600 boffins are there to brainstorm and solve problems before a potential issue becomes a huge headache to the consumer. Blackman believes Toyota “sweats the little stuff” and will always go the extra mile. “This not only speaks to the quality of Toyota vehicles, but also to the consumers who buy them,” Blackley added. In addition to production engineering, supporting teams at PEMC include indirect purchasing, information systems, strategic business management, human resources, and talent development. Photo: Toyota Motor Sales, U.S.A., Inc.
iSeeCars examined passenger cars, green vehicles, and minivans, where Toyota again held most of the list. The Toyota Avalon is first, then the Honda Odyssey, Accord, Toyota Sienna, and Prius. Rounding out the top ten are the Chevy Impala, Ford Taurus, Toyota Camry and Hybrid, and the Honda Civic. The Toyota Highlander Hybrid, Lexus RX 450h, and Lincoln MKZ Hybrid also made the list of longest-lasting vehicles. We’re not surprised to see the Impala and Taurus here. Both are common fleet/rental cars and are more likely to pile up the miles. With regard to everyday family vehicles, Honda takes the gold. There’s a general consensus that – compared to older ones – newer vehicles are less prone to breaking down. But whether old or new, every vehicle has the potential to reach 200,000 miles with proper care and diligent maintenance. While the iSeeCars study points overwhelmingly to Toyota, there are things you can do to keep your vehicle running like clockwork, regardless of make and model. Basic things like regular oil, fluid, and filter changes, and checking the tire pressures and tread depths will benefit your vehicle in the long haul. Varying weather conditions also affect the longevity of your vehicle. As the seasons change, certain parts in your vehicle can wear faster than others. It’s important to be aware of these top seasonal car repairs to help you cope with the unexpected. The more you know about car maintenance, the more likely your car will stay running for 200,000 miles and beyond. “Don’t forget regular car washes either,” Blackley added. No Comments on "Longest-Lasting Vehicles: New Data Reveals 14 of Them"